Summer is the peak travel season around the world and given the opportunity to take extended trips when school-aged children are on summer break. When you get braces, however, travel can become a little more difficult. Your top Champaign, IL orthodontist recommends the following tips for caring for your braces while traveling this summer. It is easy to pick up an extra toothbrush or toothpaste if you forget yours at home, but floss threaders can be more challenging to find. These threaders are critical for getting floss between the wires of your braces, allowing you to sweep food particles from between your teeth. Pack a little dental hygiene kit before you go to ensure that you have all of the things you need to keep your teeth healthy. Gas station stops on road trips often result in a pile of chips, gum, beef jerky, or sugary drinks that can be bad for braces. Whenever possible, avoid eating these foods, as they can damage your braces and increase your risk of tooth decay. Instead, pack a cooler full of healthy snacks before you leave on your trip. String cheese, sliced fruit, or summer sausage make excellent treats that are safe for your braces when you are on the road. Sometimes, emergencies happen at the worst times. You may take a bite of food, only to find one of your braces wires popping loose. To prepare for this type of event, have the contact information for an orthodontist in the area you are traveling. Also make sure you have the number for your local Champaign, IL orthodontics office. We can help you decide whether you need emergency orthodontic care or can find a solution that works until you’re back home. Especially if you are new to wearing braces, they can irritate soft tissues from time to time. As your teeth shift, your braces may cause mild irritation of your cheeks or gums. Dental wax is the best way to reduce this irritation, as it protects your soft tissues against the hard components of your braces. Pack some dental wax just in case, and apply a small piece to the area that is causing abrasion. As your braces realign your teeth, you may occasionally experience minor aches or pains. You don’t want these to disrupt your vacation. Dr. Shafer, your top orthodontist in Champaign, IL , recommends taking acetaminophen (Tylenol) or ibuprofen (Advil) when you are traveling. Not only are these over-the-counter painkillers good for managing orthodontics-related pain, but they are great for headaches and other minor pains that could disrupt your trip. 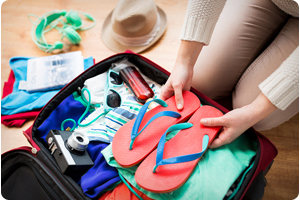 Traveling with braces doesn’t have to be a pain if you take the necessary precautions. Discuss your travel plans with Dr. Shafer, the leading orthodontist in Champaign, to ensure you take good care of your braces. Happy travels! Dr. Shafer, Champaign, IL’s favorite orthodontist offers a variety of braces and orthodontic solutions to give you the best smile ever. This includes traditional metal braces, Invisalign, Invisalign Teen, clear braces, and Damon Smile braces. Call 217-356-9595 today to schedule an appointment at our Champaign, IL orthodontics office. Get the smile you’ve always dreamed of with Shafer Smiles!